Great for stress relief, pain relief and treating anxiety, Hog%u2019s Breath is the winner of the 2002 Cannabis Cup for best indica. It was bred from Hindu Kush and Afghani in Tennessee. 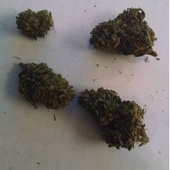 The buds are light and dark green with orange hairs and a healthy amount of crystals on the dense buds. The taste has been described as cheddar and provides an overall tingly mind and body high. The THC content is up to 13% and CBD up to 0.47%. Winner of the 2002 Cannabis Cup. Heavy indica. Be prepared to relax. Piny taste, Good for heavy pain and anxiety. A very pungent smelling Indica that will easily lay you out. Great for insomnia and pain. Winner of the 2002 Cannabis Cup for best indica. Would recommend to recreational smokers / low tolerance patients.